People have been hiring video professionals more and more, and with that I've been upping my arsenal in the gear I use to create my videos. 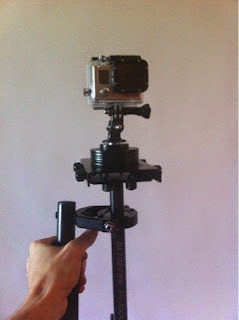 Recently, I purchased a Glidecam XR-1000. I've got a quick review of what I've found in my few days with it, since I found a lot of coverage of the HD models of glidecam, but not much mention of the XR lines. So I'll share some experience, and the single most important thing to know about calibrating your glidecam. So, why did I choose the XR-1000 vs the others? To be honest, it was inexpensive, and the weight restrictions covered most of my available camera/lens combinations anyways. I have a relatively light DSLR video body, the 6D, which feels like a toy compared to my older and bulkier 50D which has no video capability. The weight of your system is the essentially the only reason to go up to a 2000 or 4000 model. The HD line has ultra-fine tuning knobs, which would be great, but I can live without, in my cheaper XR line. After initially unboxing my glidecam and assembling by the instructions, I had it to what I thought was working. I decided to put it down and watch a few different YouTube tutorials of how others set up their Glidecams, albeit, most were using the HD models and made me a little jealous by their micro adjustment knobs. It was all set up to be balanced in my shooting position, but could quickly fall out of whack while in motion, which didn't seem right to me, there was lots of correction involved in a steady shot. I don't think this is how Glidecams work. Most important thing to know about a glidecam calibration: you need to understand when your camera/counterweight system is causing an imbalance, and when your gimbal system is causing an imbalance. 1) If your system is not balanced properly; when you hold the handle in one position, and re orient your camera to be 90, 180, 270 and 360 degrees, it will always be leaning to the same side, for instance, always to the 'pin side of the gopro', or always slightly leaned backward. This you correct by the micro adjustments and the position of weights on the bottom. 2) If your gimbal system is not balanced properly, you may have a completely stable and balanced system when the camera is oriented at 90 degrees to your shooting position, but when it is oriented at a different angle, it may develop a lean in any number of directions. Because this lean is not reciprocated when the camera faces the opposite side, there is a calibration issue in your gimbal. Watch this video for some help: http://youtu.be/Q3XJ8eToaYo . The video helped me, however after completing my own calibration, I think the video could have used a few more pieces of information, so I'll work on my own in the near future. I balanced the system with my GoPro first since it was the most centrally balanced camera I had. And allowed me to balance the system while having a camera in the centre hole of the 'cheese plate'. To have my 6D centre of gravity located over the shaft, It needs to be displaced about two holes in two directions. The GoPro was a little light to balance the system on its own weight however, so I used some of the counterweights from the bottom, to bulk up the top, and had them on the screw which the GoPro tripod mount connected to. It took about three days to balance it. First one, I did following instructions, and it never was quite perfect, second one I realized gimbal needed calibration, but had trouble locating the tools, being a number 10 Torx wrench with a very short arm, was most difficult, and then a day of tweaking and testing while walking it around my home. The third day, I took it out for a test to chase Steph while she rode her horse at the farm. The footage follows below. After I saw this footage, I decided to further balance the system and during the shots below, it was probably calibrated to ~97% perfect, and now I like to think I've gotten the next two or three percent, which I'll know after my next day of testing. So that's my brief experience with a glidecam thus far, and looking forward to sharing more footage and more tips about how to use it effectively! Enjoy the quick little video below from my first day out with the system.